As a foodie blogger and all around food fanatic, when one of your friends says you need to try, fill in the blank food, at, fill in the blank restaurant, you only have one option. That option is to plan a date, and make it happen. If I did not listen to peoples suggestions I would be sitting at the same 15 restaurants all the time, scouring their menus for something that I have not yet tried. 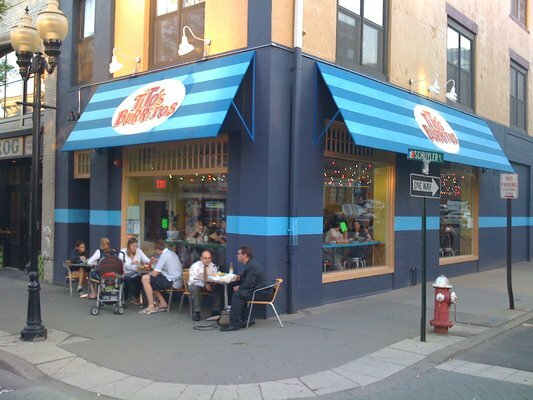 So with that said, while out at a bar one night when my friends told me I had to try Tito’s Burritos located at 26 Washington St., in Morristown, NJ, without hesitation and much like a 1970’s movie star, I replied sure enuff’. After talking about this establishment for damn near 30 minutes at the bar, making our entire group famished and craving Mexican Food, I could not resist doing some research on the internet when I got home. The Googles informed me that not only was there a Tito’s in Morristown, NJ but another location just down the street from me in Ridgewood, NJ. Once I found out this tidbit of information I knew I was going to have to attend Tito’s Burritos as my alter ego The Blue Collar Foodie and not as the mild manner Clark Kent, so I could inform my readers all about my gastronomic adventure. After planning a date that fit into both of our calendars, Kat and I met up with Brian and Kristen in downtown Morristown, New Jersey to check out this trendy burrito spot. Unfortunately, dinner time in Morristown, NJ is as crowded as Times Square on a Saturday afternoon, when it comes to finding a parking spot. After we completed our search for a parking spot and scored a decent one thanks to the eagle eyes of our friends, we proceeded to walk towards Tito’s Burritos which about a five minute walk from our car. Upon approaching this establishment I got a vibe that I have not felt since I visited San Diego, California and ate at a local burrito joint that was highly recommended in the downtown area. From a distance you can tell, that Tito’s Burrito’s is not all about flashy decorations and flair like other restaurants trying to lure you in with bling only to break your heart with sub-par sustenance. When you enter Tito’s there is a small eating area and a counter that is designed to make ordering quick and easy. There menu is posted on the wall in giant letters so everyone can read it while the wait on line. Gracing that menu is a myriad of Mexican dishes that would make Speedy Gonzales’s grandmother drool, and from what I heard that lady can cook. The menu is broken down into categories for ease of use, and lists Burritos, Tacos, Salads, Nachos, Quesadillas, Kids Dishes, Sides, Wings, Chicken Strips, and Desserts. First and foremost, there is the Burrito list and considering that this spot is named Tito’s Burritos and not Tito’s Tacos I think Tito knows how to rock him some yumminess wrapped in a tortilla. The highlights include the Mac Daddy described as being filled with grilled grade A steak with black beans, yellow rice, Tito’s cheeses, sour cream, pico de gallo salsa & fresh guacamole for $9.50, or for those looking for something slightly different they offer the Hang Five Shrimp Burrito which is chock full of Sautéed garlic shrimp, with shredded cabbage, yellow rice, pico de gallo salsa & cilantro/lime sauce for $9.25. You can also find out the Special Burrito of the Day by calling, checking the chalkboard, or by checking out Tito’s Facebook & Twitter feed to be informed. When I visited Tito’s the special of the day was a Jamaican Jerk Burrito with jerk flavored chop meat and all the fixings. The rest of the menu did seem intriguing and almost tempted away from the Burrito list with offerings such as the Steak Taco, the Classic Quesadilla, and a boastful statement next to the wings that reads “THE BEST IN NEW JERSEY.” I was tempted to stray from my first instinct, but as in life decisions like that almost always end in heartbreak and despair. So instead of wishing I stuck with my gut, when I reached the counter I ordered the Jamaican Jerk Burrito which set me back $9.50, while Kat went with the Mac Daddy, which as stated above was also $9.50. As for Brian and Kristen, they ordered another Mac Daddy and two steak tacos respectively. After we ordered, I wandered around the establishment to get a feel for the restaurant. It was obvious by the décor that Tito is into long boarding, surfing, and hanging out hippie style. All the Tito’s swag that is for sale has a retro southern California feel to it. Even their slogan, which is, “It’s all good,” can’t be uttered without conjuring an image of a surfer giving you the hang ten sign. Furthermore, in the back of the restaurant there is a wall of pictures submitted by loyal customers and famous people that have all, “Shown Them Their Tito’s,” which includes flicks of Tito’s favorite customers, exotic and interesting locations where Tito’s stickers have been sighted, special events, Tito’s staff and more! The Tito’s stickers are free with any purchase by the way. As our order came up, I ventured to the condiment cart to dress my burrito in style. This cart is jam-packed with all of the necessities to make your burrito ready for the gala. 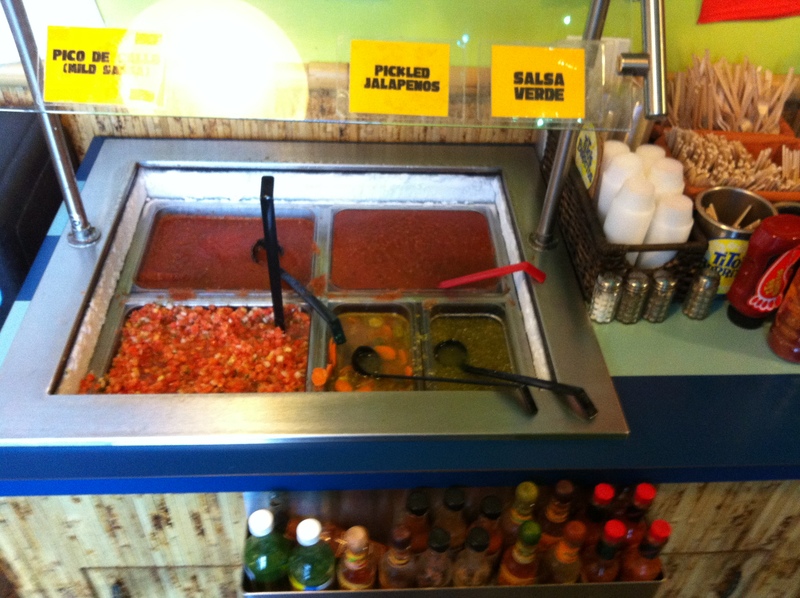 Fresh made Pico De Gallo, Pickled Jalapenos, Salsa Verde, and over a dozen different hot sauces are at your fingertips to garnish your selection however you please. 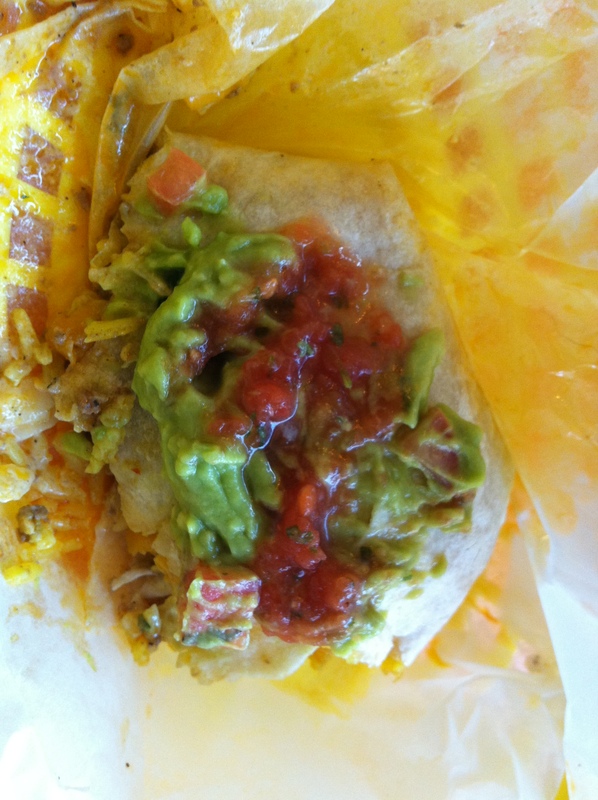 At first glance I was slightly disappointed in the overall size of my Burrito which was defined as HUMONGOUS burritos. 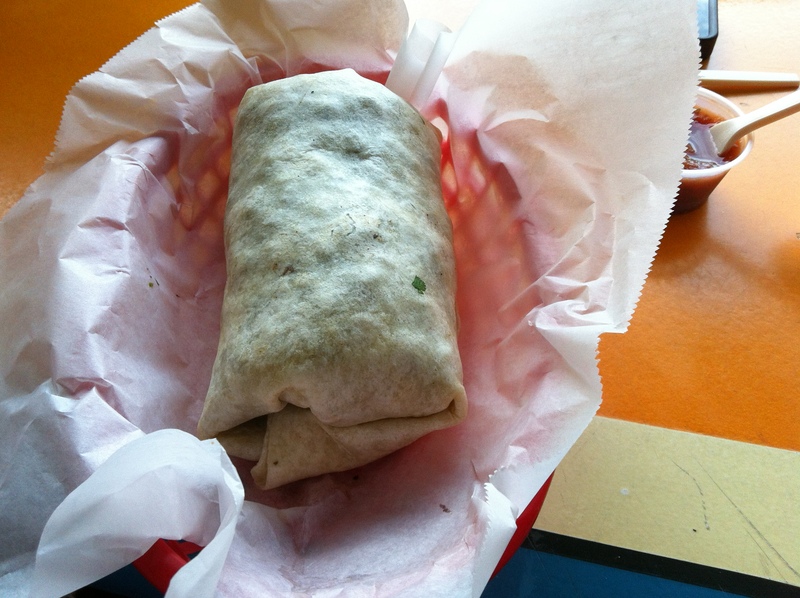 Now if you follow my blog, you know I have already reviewed a spot called Blue Moon which offers burritos the size of my forearm, so I was sad to see that Tito’s did not measure up to Blue Moon’s gargantuan fare. But as many ladies have told many men, many many times size sometimes is not all that matters. After the first bite of this large, but slightly not HUMONGOUS, burrito, size did not matter. The flavor that was contained in this 12 inch tortilla was all that I cared about, and it was tremendous, especially when topped off with their fantastic Guacamole. As Kat stated by the end of the meal, I just want it to last forever because it tastes so damn good. The Burritos seemed to have the right balance of ingredients swimming in the proper quantity of sauce and cheese, which is a hard thing to find in a world of mass produced burritos that are put together with caulk guns and ice cream scoops with about as much care as a third rate doctor at a clinic is Botswana. These Burritos seemed to be judiciously constructed by some sort of Zen burrito master with a fifth degree black belt in yummy. My only complaint was that according to the menu, we were supposed to offered free homemade tortilla chips with the purchase of our burritos but we never received them, nor did we ask for them because I did not realize this menu side note until as we were about to leave. 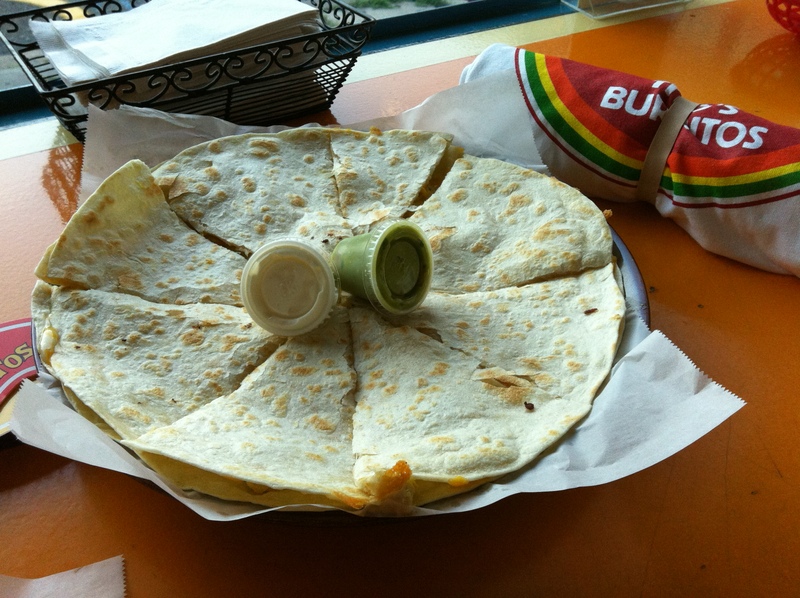 While we were finishing up our meals Brian decided to order a classic Chicken Quesadilla for all of us to share, which of course I did not complain about because then I would get to try one more item on the menu. The Quesadilla came with Tito’s Guacamole and Sour cream and tasted so good that even though we were all filled almost to capacity, we did not waste one bite of it. The chicken inside was plentiful and grilled just right and when combined with the sauce and cheese made for a gooey masterpiece. Thanks to Brian and Kristen, Tito’s Burritos has earned a coveted spot in my regular rotation of pseudo fast food joints, and I can’t wait to try the one located on East Ridgewood Ave, in Ridgewood, NJ. 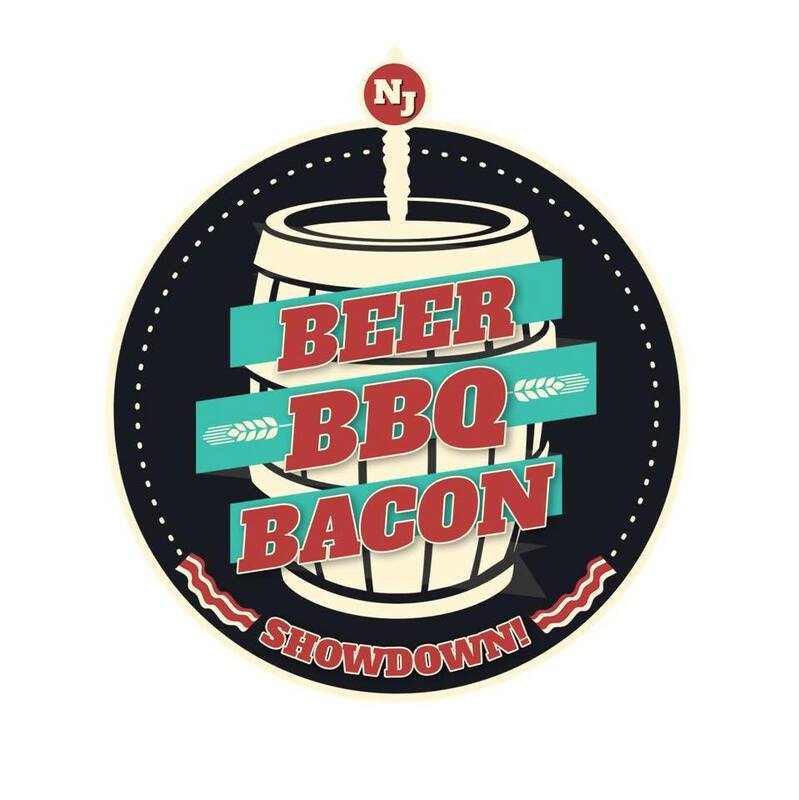 From the relaxed bohemian atmosphere to the serious eats that are served, Monday – Saturday: 11:00am to 9pm and Sunday: noon to 8pm, Tito has made this Blue Collar Foodie very pleased. As an added bonus, if you work in the area of Ridgewood or Morristown, both Tito’s Burritos locations offer to-go orders and delivery which can save you some valuable time on your lunch hour.